This week I have been going over some of the items a PC will be able to buy at the stores. A simple endeavour you may have thought, until you take into account certain items you may have added or altered for some reason. For example, I wanted to add the possibility of buying one or two plot items. (i.e. A toolset term meaning items that cannot be destroyed as opposed to items that pertain to the story.) However, as I alluded to in my last post, this prevents me from being able to set them at a certain price for sale, and so I had to write some code to effectively allow me to reset the plot flag after the item had been purchased. Another area where there was a problem was when I added ammunition to a weapon store. 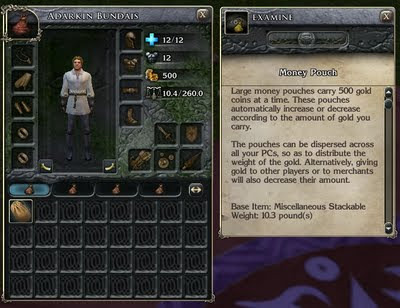 In Better The Demon, ammunition is sold in stacks of 20 as opposed to 99 due to an overhaul of the economy system. Unfortunately, due to the way ammunition stacks by default (in quantities of 99), I found that an exploit was introduced because the player could buy a proportion of the the stack at a skewed proportional cost. To get around this problem, I had to alter the stacking limit of ammunition (and throwing weapons by the way) in the baseitems.2da to the same as my shop stack quantities of 20. This turned out to equate to the PnP definition of a number of arrows in a quiver, so I was not disappointed about the lowered slot figure. Furthermore, as NWN automatically restocks arrows into the arrow slot as they are used, I did not see it as a problem. If anything, it simply reflects a more realistic ability to carry this type of item. One of the first things a player will notice when they play Better The Demon is that by comparison to the official campaigns, the world of Althéa is a low magic world. There will be hardly any magic items for sale at stores at all. In fact, the only items that will be available are scrolls and potions (and then only by a few people). Weapons, armour or other wondrous items will not be available from any stores. As an example, the most expensive item currently available in a sundry store is a gold necklace at 100 gp. A Healer's kit (+3) comes in second at 68 gp. In the local arms and armour store, the most expensive item is masterwork chainmail at 168 gp. The idea reflected here is that magic is not an everyday item that the local population can afford to buy, so items generally afforded are stocked instead. That said, crafting items, recipe books and new recipes can be bought at reasonable prices for those with the skills and/or extra gold to make them. The problem is, there is hardly anything to be made from selling magic items as they cost a great deal to make and there are not enough people around who can afford to buy them. The odd item of magic will still be bought from a PC (if they acquire one and wish to sell it), but the store keeper will normally cap their costs and only purchase it if they have a buyer in mind. In other words, once a magic item is sold to a store keeper, it will be sold on shortly afterwards to a special buyer, thereby effectively removing it from the world. Some of the items on sale include Amraphael's Light Sources and the chalk that was found in his Zork Adventure. Amraphael is a wizard at making custom content and I fully acknowledge the wonderful contributions he has made to help make my own module the way I wanted. Another thing players will soon discover is that they will no longer be able to carry items and gold around with them as if they had an invisible All-Terrain Cart of Huge Carrying Capacity. As I have already mentioned above, ammunition will now take up more inventory slots, larger items have more weight than the default values and gold is now carried in bags of 500 gp at a time. (NB: A PC is allowed to carry less than 500 gold without any weight restrictions.) Take a look at the screenshot below to see the gold bag description and how it will impact the PCs. The idea behind this is that the player will now see there are other benefits to having greater strength and/or someone to help them on an adventure, even if it is just to help carry back any treasure they might find. Medium plot guidance. My play style has become very lazy! However, I think it really depends on the nature of the mod: if it is very much story-driven, I don't see many options to give excessive freedom without either jeopardising the advancement of the plot or making it unrealistic. E.g., if I understood correctly what you mean, upsetting a plot NPC would prevent the advancement of the plot. Therefore the PC would: a) be stuck and end the game, which is kind of frustrating; b) have to reload and chose the "correct" option, which is frustrating and ultimately makes the said freedom rather pointless; c) advance the story anyway pursuant to a workaround, which may seem unrealistic, gives you, the builder, extra work and, eventually, downgrade said freedom to mere flavour. Complete freedom however, is fine for optional content or for more open-ended games. Your use of the word "flavour" helps highlight the point I am trying to make. For I believe the word "flavour" is a better description to use when designing a game than "freedom", because every module is limited to the design of the builder, demonstrating that any "freedom" is actually an illusion. To clarify my own preference, I believe the player may be given the option to upset an NPC, but only if there is a reasonable means of regaining faith with them, and that there MUST still be a way to finish the game's MAIN quest at the very least, even if the player misses out on some side quests because of their preferred style/flavour of play. a) A design should NEVER leave the player unable to finish the game's MAIN plot, regardless of its "plot level". c) This point is the crux of my issue. However, I think the point you make is actually more "realistic" as opposed to "unrealistic" as you say. I wholeheartedly agree that the concept gives a great deal more work for the builder, but I do believe it serves to add realism (or flavour) or even "choice" if you like, to how the player pursues their experience of the game. Maybe I am misinterpreting what players mean by "freedom", but whenever I used the term, I believed it to mean being able to accomplish an objective in many different ways, including one that may at first not have been thought of by the builder ... or so I believed to be the case. ;) Note, however, this is not at the expense of "losing the plot". The plot must never be lost regardless of the amount of "freedom" a player is given. However, having said all this, I believe I must recognise my own limits and simply accept the fact that I do not have enough man hours or resources to be able to offer as many "flavours" as I would like to. As you say, the closer a builder tries to give the player ultimate freedom, the more hours of coding are required. I believe coding for "Complete freedom" is an unachievable task, just by definition. Even coding for one with "Minimal Plot" is turning out to be exceedingly complicated and one that I am not sure is really worth the time spent on it to the benefits. Now that I have started on this level, however, I will continue to support it wherever I can. But I do recognise why settling to code for "Medium" or "Maximum" plots and aiming at a particular audience is the best/easiest way to go. And all this is actually a way to answer your first comment (which may be like my own gaming style and that of others) in that you believe your own style may have become lazy. I mean why should this be the case? The only reason any gaming style becomes "lazy" is more because the options to do more ("exercise your gaming styles") has been dictated for you by the game design. After all, if you knew you could do *anything* in a module to solve your problem, I am reasonably sure you would not just follow the given course of action. You would start to look at the problem in different ways other than the offered solution. The game would become a test of one's wits as opposed to discovery *the* path through the game. As I say above though, the *anything* path will never be achieved, however, a game that gives as many options as possible may start to give the feeling that you can play the game the way you want to rather than following a given pattern. I suppose that's my grief with many games - It's hard to find/play something that keeps giving you something new and refreshing to keep going - as much in the playing as unravelling the story. Thanks for sharing your comment again though, it does help me to unravel my own thoughts, which goes a long way to help move on. Heya! Your mod's looking great btw! But the real reason I'm commenting is that I can't seem to find your e-mail address anywhere. I'm using this comment to talk to you then instead. I'm having some problems with my overland map and I'd like something to compare my scripts, and such, with. Could you e-mail me at mazena86@gmail.com? Having some problems with the encounters to be exact - the mobs aren't spawning in the encounter areas.